Spring Clips - Airsan Corp.
Airsan spring clips provide a positive filter retainment in many types of filter housings. 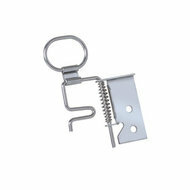 Spring clips are available in galvanized steel and stainless steel material. Both 1” and 2” clips are available.